The Andersonville prisoner of war camp, which operated from February 27, 1864, until the end of the American Civil War in 1865, was one of the most notorious in U.S. history. Underbuilt, overpopulated, and continuously short on supplies and clean water, it was a nightmare for the nearly 45,000 soldiers who entered its walls. In late 1863, the Confederacy found that it needed to construct additional prisoner of war camps to house captured Union soldiers waiting to be exchanged. As leaders discussed where to place these new camps, former Georgia governor, Major General Howell Cobb stepped forward to suggest the interior of his home state. Citing southern Georgia's distance from the front lines, relative immunity to Union cavalry raids, and easy access to railroads, Cobb was able to convince his superiors to build a camp in Sumter County. In November 1863, Captain W. Sidney Winder was dispatched to find a suitable location. Arriving at the tiny village of Andersonville, Winder found what he believed to be an ideal site. Located near the Southwestern Railroad, Andersonville possessed transit access and a good water source. With the location secured, Captain Richard B. Winder (a cousin to Captain W. Sidney Winder) was sent to Andersonville to design and oversee the construction of the prison. Planning a facility for 10,000 prisoners, Winder designed a 16.5-acre rectangular compound that had a stream flowing through the center. Naming the prison Camp Sumter in January 1864, Winder used local slaves to construct the compound's walls. Built of tight-fitting pine logs, the stockade wall presented a solid facade that did not allow the slightest view of the outside world. Access to the stockade was through two large gates set in the west wall. Inside, a light fence was built approximately 19-25 feet from the stockade. This "dead line" was meant to keep prisoners away from the walls and any caught crossing it was shot immediately. Due to its simple construction, the camp rose quickly and the first prisoners arrived on February 27, 1864. While the population at the prison camp steadily grew, it began to balloon after the Fort Pillow incident on April 12, 1864, when Confederate forces under Major General Nathan Bedford Forrest massacred black Union soldiers at the Tennessee fort. In response, President Abraham Lincoln demanded that black prisoners of war be treated the same as their white comrades. Confederate President Jefferson Davis refused. As a result, Lincoln and Lt. General Ulysses S. Grant suspended all prisoner exchanges. With the halt of exchanges, POW populations on both sides began to grow rapidly. 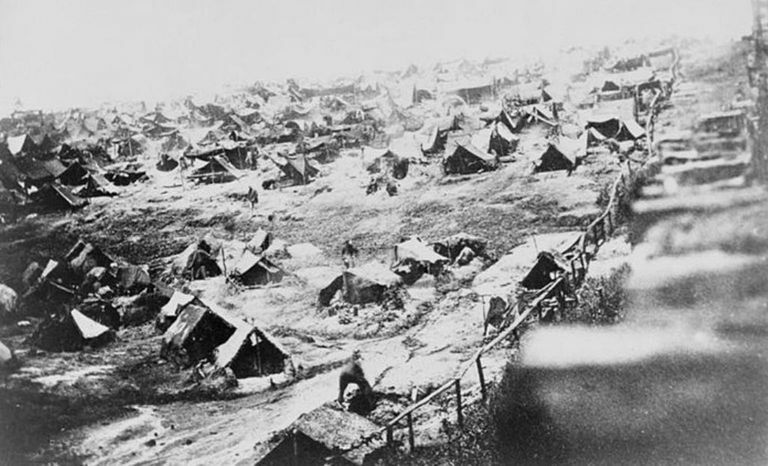 At Andersonville, the population reached 20,000 by early June, twice the camp's intended capacity. With the prison badly overcrowded, its superintendent, Major Henry Wirz, authorized an expansion of the stockade. Using prisoner labor, a 610-ft. addition was built on the prison's north side. Built in two weeks, it was opened to the prisoners on July 1. In an effort to further alleviate the situation, Wirz paroled five men in July and sent them north with a petition signed by the majority of the prisoners asking for POW exchanges to resume. This request was denied by the Union authorities. Despite this 10-acre expansion, Andersonville remained badly overcrowded with the population peaking at 33,000 in August. Throughout the summer, conditions in the camp continued to deteriorate as the men, exposed to the elements, suffered from malnutrition and diseases such as dysentery. With its water source polluted from the overcrowding, epidemics swept through the prison. The monthly mortality rate was now around 3,000 prisoners, all of whom were buried in mass graves outside the stockade. Life within Andersonville was made worse by a group of prisoners known as the Raiders, who stole food and valuables from other prisoners. The Raiders were eventually rounded up by a second group known as the Regulators, who put the Raiders on trial and pronounced sentences for the guilty. Punishments ranged from being placed in the stocks to being forced to run the gauntlet. Six were condemned to death and hanged. Between June and October 1864, some relief was offered by Father Peter Whelan, who daily ministered to the prisoners and provided food and other supplies. As Major General William T. Sherman's troops marched on Atlanta, General John Winder, the head of Confederate POW camps, ordered Major Wirz to construct earthwork defenses around the camp. These turned out to be unnecessary. Following Sherman's capture of Atlanta, the majority of the camp's prisoners were transferred to a new facility at Millen, GA. In late 1864, with Sherman moving toward Savannah, some of the prisoners were transferred back to Andersonville, raising the prison's population to around 5,000. It remained at this level until the war's end in April 1865. Andersonville has become synonymous with the trials and atrocities faced by POWs during the Civil War. Of the approximately 45,000 Union soldiers who entered Andersonville, 12,913 died within the prison's walls—28 percent of Andersonville's population and 40 percent of all Union POW deaths during the war. The Union blamed Wirz. In May 1865, the major was arrested and taken to Washington, DC. Charged with a litany of crimes, including conspiring to impair the lives of Union prisoners of war and murder, he faced a military tribunal overseen by Major General Lew Wallace that August. Prosecuted by Norton P. Chipman, the case saw a procession of former prisoners give testimony about their experiences at Andersonville. Among those who testified on Wirz's behalf were Father Whelan and General Robert E. Lee. In early November, Wirz was found guilty of conspiracy as well as 11 of 13 counts of murder. In a controversial decision, Wirz was sentenced to death. Though pleas for clemency were made to President Andrew Johnson, these were denied and Wirz was hanged on November 10, 1865, at the Old Capitol Prison in Washington, DC. He was one of two individuals tried, convicted, and executed for war crimes during the Civil War, the other being the Confederate guerrilla Champ Ferguson. The site of Andersonville was purchased by the Federal government in 1910 and is now the home of Andersonville National Historic Site.